Last week we wrote about the safest way to enter and exit a helicopter whenever you’re on a Life’s An Adventure guided walk that includes a scenic chopper flight. This week we thought we’d list all the Life’s An Adventure’s guided walks that includes scenic flights – be it by helicopter or plane. The scenic beauty of a helicopter flight. First off the rank is the five-day Larapinta Trail walk in Central Australia. On day three after a glorious 12km hike you hop on a helicopter at historic Glen Helen Homestead. 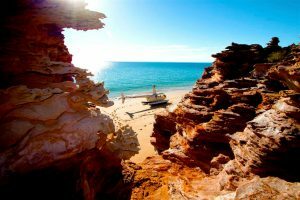 You’ll take in the breathtaking vistas of the West MacDonnell Range, Glen Helen Gorge, Finke River, Ormiston Gorge, Mt Sonder and Gosse Bluff. Our next scenic flight is on the five-day Kimberly/Bungle Bungles and Beyond trip in northern WA. This is something special as day two is a heli-hike into Piccaninny Gorge and no other walking company offers this. First you get to see Piccaninny Gorge in all its glory from 1000 feet before the helicopter lands on top of the gorge and you have a 10km return hike deep inside this ancient rock formation. Now this is one for the books! On the last day of the four-day Cape to Cape walk in WA, after a leisurely 6km beach walk a helicopter is waiting to whisk you away to the famous Leeuwin Estate for a long lunch and a spot of wine tasting. The helicopter ride will make you really appreciate the glorious coastline of the Margaret River region. A scenic flight in WA. One of Life’s An Adventure’s most popular guided walks is the three-day Three Capes Walk in Tasmania – and one reason for this is the helicopter flight on the last day. This is the pièce de résistance of what is already a spectacular walk. The helicopter takes you over Port Arthur, Tasman Island and Cape Pillar where you’ll be able to follow the trail of the official Three Capes Track. Two other wonderful Tassie walks are the three-day Cradle Mountain Walk and the four-day Cradle Mountain and Walls of Jerusalem walk. Both include a scenic helicopter flight where you get to see Cradle Mountain in all its majesty. Heading to Victoria, the three-day Grampians walk explores the area’s weathered peaks and escarpments, towering rock formations, cascading waterfalls and fern filled gorges. On day three a helicopter collects you from your lunch spot at Deirde’s Olive Grove and you get to appreciate the Grampians from the air before being dropped off at Sale. Staying in the Garden State, the three-day Great Ocean Walk should be on your bucket list. Whilst the famous Great Ocean Road doesn’t always follow the coastline, this walk allows you to go where the road doesn’t. On day three there’s no other way to truly appreciate the beauty of the Twelve Apostles then by helicopter and that’s what you’ll be doing! Heading to SE Qld, the three-day Scenic Rim Walk explores escarpments, ridges and forests across the ancient volcanic plateaus of the Great Dividing Range. And on day three after a stunning walk up Mt Mitchel a helicopter flies you to Kooroomba Vineyards. And finally, the three-day Gold Coast Hinterland Traverse Walk takes you through the spectacular Lamington National Park, a World Heritage Area comprising of Australia’s largest remnant of ancient subtropical Gondwana Rainforests. On day three after a stunning walk along Green Mountain, a helicopter picks you up at O’Reilly’s Rainforest Retreat and takes you to O’Reilly’s Vineyards, Canungra Valley for a sumptuous lunch and some wine tasting. So there you have it, 10 great guided walks and 10 memorable scenic flights. Now the hardest thing is to choose is which one you want to do!